Ivan Marusic is an ARC Laureate Fellow and a Redmond Barry Distinguished Professor in the Department of Mechanical Engineering at the University of Melbourne. 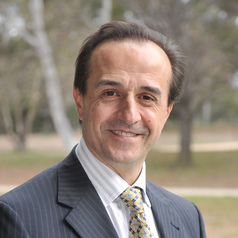 He received his PhD in 1992 and BE (Hons) Mech in 1987 from the University of Melbourne. His research is primarily in experimental and theoretical studies of turbulence at high Reynolds numbers. This includes studies in atmospheric surface layer flows and aquatic ecosystems. Prior to returning to Melbourne in 2007 as an ARC Federation Fellow he was a faculty member at the University of Minnesota, where he was a recipient of an NSF Career Award and a Packard Fellowship in Science and Engineering. He is a Fellow of the Australian Academy of Science and the American Physical Society, an Associate Editor of the Journal of Fluid Mechanics and the Journal of Hydraulic Research.